A Gurgler makes a great redfish pattern. AS THE TIDE TURNED and began to flood, I poled the boat across a shallow grass flat, just inside the sandbar that separated the flat from the Intracoastal Waterway. Many of the large boats that blasted past reminded me of Rodney Dangerfield’s short, destructive, ill-fated yacht voyage in the movieCaddyshack. So when I muttered ‘what a couple of Rodneys’ when two boats passing in opposite directions neglected to slow down, and slammed loudly into each other’s massive wakes, my fishing buddy Doug Hedges knew exactly what I was talking about. It was amazing — we were close enough to the chaos of the ICW that we could read the registration numbers on the sides of passing boat hulls, and we were stalking tailing redfish. Except for us, these redfish were unmolested. You have to give Doug credit, he seems ready to try something new at least once. And on the bow, he stood ready to cast to the next tailer that came into range — with, of all things, a gurgler tied to his tippet. Some folks know this is a good technique, but when I suggest they try a surface fly for tough tailing redfish, most anglers show a look of disbelief, even suspicion. But not Doug, he was all for a new approach. A topwater fly is farthest from many angler’s minds when they are casting to tailing redfish. The fish are, after all, digging their noses in the bottom for shrimp, crabs, worms, or small bottom-dwelling fish like gobies and blennies. Why on earth would an angler in their right mind choose a surface pattern? After all, redfish don’t eat with their tails. A topwater fly can be a good choice for three reasons. First, a redfish intent on digging out prey buried in the bottom is often so focused that it doesn’t see it’s surroundings. This is one reason it is possible to pole a boat right up to a tailing redfish without being noticed until the boat almost overtakes the feeding fish. On numerous occasions I’ve been able to wade close enough to a tailing redfish to touch it with my rod tip. Actively tailing redfish can also stir up enough bottom that visibility in their immediate surroundings drops to zero, obscuring any fly in the murk. In either case, even the most perfectly placed fly might not be noticed. 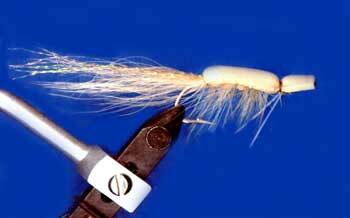 It can be quite a challenge to deliver a fly to a redfish buried in grass. Second, even tailing redfish pick their heads up out of the bottom every once in a while as they move on in search of more prey. There is a good chance that a redfish moving in search of more food will see the motion at the surface and investigate. And it’s not uncommon for a bottom grubbing redfish to scare up small prey that make a break for it. So that same redfish that was so engrossed in digging for a mud crab that it never saw the perfectly presented fly might see the surface commotion of a gurgler, and mistake the fly for an escaping prey. Many times I’ve watched small shrimp and fish squirt from the water as they try to avoid a feeding redfish. And I’ve seen redfish that were lackadaisically tailing suddenly erupt at the surface to grab these would-be escapees. Third, in many of the flats where anglers fish for tailing redfish, the seagrass is thick and tall. The densely packed seagrass blades can act as a barrier, preventing a tailing fish from seeing a fly only inches away. 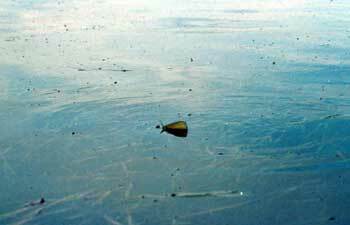 And at a very low tide, the upper portions of the grass blades lay across the surface, and the tips reach to the surface at a medium tide, making it tough to get a sinking fly to the bottom. A weedless gurgler helps get around both of these challenges and puts the fly in an area where it can be seen by a redfish. A gurgler is my surface fly of choice because it is light, so is easy to cast long distances and lands on the water lightly. Both characteristics are necessary when fishing to tailing redfish on shallow flats. The gurgler is also versatile in how it can be fished — loudly, so it makes a lot of commotion, or softly, so it barely ripples the surface. So it’s easy to imitate different prey — soft and slow for shrimp and loud and fast for the finger mullet that can be abundant in fall — and the changing moods of redfish. I first started using gurglers for tailing redfish, in part, out of frustration. My favorite flats for tailing redfish are covered with lush turtle grass and shoal grass. It can be wearing to make good cast after good cast to a tailing fish and get no response because it never saw the fly among the many grass blades. My strategy when fishing for tailing reds is pretty simple — get the fly into the fish’s sight zone and make sure the fish sees it. I know the fish has seen the fly when it changes it’s behavior — it either reacts positively, by following or taking the fly, or negatively, by avoiding the fly or suddenly swimming in the other direction. Often, redfish feeding in thick seagrass don’t react at all, so likely never see the fly. An unweighted fly that sinks very slowly is a good choice in these situations because the fly spends more time in mid-water, where it is more visible, while a weighted fly that sinks straight to the bottom is quickly lost. However, even an unweighted fly that hovers mid-water can remain unseen by a redfish feeding in thick grass. If I can get the gurgler in front of the redfish, it’s a good bet the fish will see the fly. Another good situation for using a gurgler is when there are a lot of redfish around, but they aren’t staying put long enough to stalk and cast to any particular fish. The first time I tried a gurgler in frustration was on a day when the flat was full of tailing fish. Well, fish were tailing everywhere but where I was. Fish weren’t feeding very long in a spot, but instead would tail for a few seconds and then move on. There was really no point in stalking, so I drifted across the flat blind-casting a gurgler. This can be an especially successful strategy in late summer and fall when juvenile mullet (aka finger mullet) are often common on the flats, and a favorite food of the larger redfish that invade the flats in fall. My favorite situation for using a gurgler is casting to redfish that are pushing a bow-wake as they slowly cruise from one eating spot to the next. I’ll often see these fish tail some distance away, then right themselves and slowly head off in search of more prey. Sometimes, the dorsal and upper tail fins of these fish will be out of the water. These fish move slowly and deliberately enough that I can guess their course and put myself in the best location to make a good cast. I like to lead these fish by a healthy enough distance that they can’t see the fly or fly line in the air, and let the fly sit until they are within a few feet before beginning my retrieve. When casting a gurgler to a tailing or cruising redfish, I use a leader of 10 – 12 feet or more, with 12 lb. fluorocarbon tippet. For tailers I use a long leader because I try to cast past the fish, to the side the head is pointing. I then bring the fly back over the fish. If the fish continues to tail, I’ll make the fly pop to get the fish’s attention. If the fish is not tailing, I continue retrieving the fly in short strips. Using this strategy, a shorter leader would cause the fly line to land over the fish, likely spooking the fish and ruining my chances for a hookup. For blind-casting, a longer leader means I have less chance of accidentally lining a fish with the fly line during a cast. The longer leader also provides better separation between the fly line and fly, so there is less chance a redfish coming to check out the fly’s commotion will intersect the fly line. Cruisers are swimming near the surface, with their cone of vision pointing forward and upward. A longer leader helps me keep the fly line out of this cone of vision during the cast. I use 12 lb rather than 20 lb leader because heavier leader tends to pull the gurgler down. And I find that fluorocarbon tippets make a difference because the waters I fish tend to be clear. Long casts are usually best, because even redfish that attack the gurgler aggressively tend to miss the fly a few times before they get it in their mouth. With their mouth on the underside of their snout, redfish have to either raise their head out of the water so they come down on the fly, or turn sideways to get a better angle on the fly from below. When a redfish brings its head out of the water to get over the fly, its eyes come above the water surface, so they can spot an angler that is close by. And less aggressive redfish will often follow a gurgler for an excruciatingly long distance, so a long cast gives the fish more time to decide to take the fly. When a redfish strikes a gurgler, it is usually an exciting show — often an explosion on the fly. The temptation is to rear back and set the hook. In most circumstances, this will result in a fish circling in confusion as it searches for the fly that you just launched past your ear. Remember, they’ll often miss the fly the first time. It takes some control, but keep stripping the fly in the same manner that induced the redfish into attacking it, and strip strike when you feel tension on the line. Don’t lift the rod until you’re sure the fish is hooked. Easier said than done. Getting in range of a tailing redfish was the biggest challenge. For a while, it seemed that every fish we saw would tail aggressively until we were just into casting range, and then suddenly disappear, only to reappear a few minutes later just a little farther away: a frustrating pattern that redfish seem to follow frequently. Doug got decent casts to a couple fish, one of which ignored the fly as it moved off to another spot, and a second that looked at the fly and suddenly bolted when Doug stripped the fly ever so slightly. The eruption caused by the second fish was entertainment in itself. Doug made a couple casts that had been ignored by a third tailer, as the fish alternately tailed and moved, tailed and moved. When the fish had not shown itself for a minute or so, I began to scan the flat for more action. Then Doug let out a“WHOOP.” I turned to see his rod doubled over and fly line jumping off the deck and through the guides in pursuit of a surprised redfish. A few minutes later, we had the fish boatside, and Doug had his first redfish on a gurgler. We were able to get one more fish before the tailing action died down, the sun dipped low, and we made the run back to the boat ramp. Would a standard fly pattern for tailing redfish have worked? Perhaps, but it wouldn’t have been as exciting or visual a take. And we didn’t have to worry about making the perfect cast and keeping the fly snag-free. The gurgler is an easy fly to tie, and is surprisingly durable for being made mostly of soft foam. I use pliable closed cell foam in either tan or white. Tan is good for imitating shrimp and some of the small fish that live on the flats. White is good for imitating finger mullet and is easier to see at dusk, one of my favorite times for fishing for tailing redfish. I use a long shank hook — either for tying a longer, shrimp-like body, or to tie a keel-hook style weedless version. For the standard, long-bodied pattern, I tie in a mono weedguard just behind the hook eye. For the keel-hook style fly, I use pliers to bend the hook backwards, the bend at approximately 2/3 the length of the shank behind the hook eye. The foam body is then tied on the same side of the hook as the hook bend. This fly will ride with the hook point up, making it weedless. I originally began tying the keel-style fly because so many redfish were striking the fly without getting hooked. The theory is that since redfish so often come down on the fly from above, an upward pointing hook should have a better hookup ratio. The jury is still out on this, but the hookup rate is certainly no less than the standard pattern. This clearly means that more research is needed.